Forum: What Changes Should Be Made To The MCDP Constitution? Citizens Together Forums will sometimes be restricted to members of specific groups. 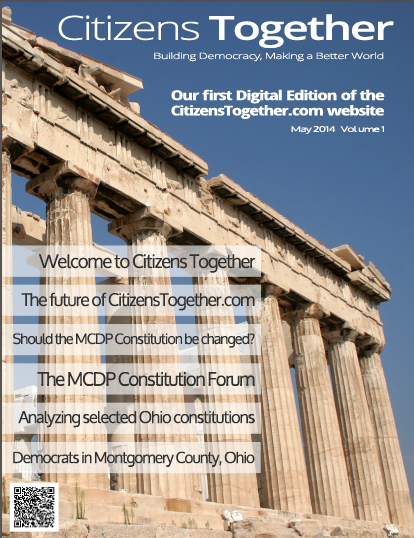 The forum in this edition is restricted to registered Democrats who live in Montgomery and Greene Counties. The idea is that it would be valuable to have an in-depth conversation just among MCDP stakeholders, those most invested in making the MCDP successful. These stakeholders are easy to identify: local Democrats who vote in Democratic Primaries. All Montgomery County and Greene County Democrats are invited to participate in this Forum. To request an invitation, please fill out the contact form below. I need your name and zip code so that I can check your name with the Board of Elections voting records. If you not a Democrat living in Montgomery and Greene Counties, I hope you will participate in the Survey and I hope you will read and make comments on the articles. Request an invitation to the MCDP Forum by filling out the form below. The information requested is for validation purposes only and will not be shared, sold or published.